The Australian Alps is a special location. If you’re considering buying land there, we don’t blame you. Mountain ranges give way to uninterrupted horizons. Wild winter snow gives way to spring and summer wildflowers. It’s an ancient landscape with a long history steeped in Indigenous tradition. Over 600 million years of geology has shaped Australia’s unique alpine environment. The mountain ranges are some of the oldest in the world, with some minerals in the rocks found to be over three billion years old. The age and diversity of the rocks has meant that the Australian Alps is like no other alpine region in the world – it’s home to fertile soil up to one metre deep in places. The Australian Alps is a place of water-loving ferns, sphagnum bog and mineral-rich wetland known as “fen”. There’s woodland and grassland, tall, red snow gums and distinctive plants, animals and ecosystems. It’s hugely important that you respect this when planning your build so that you can make your own contribution to conserving this natural wonderland. Study a topographic map of any land you are considering and get to know it. Identify flat areas that may be good for laying the foundation, as well as areas that will need to be cleared of rocks or debris. Establish your boundaries and have the land evaluated. Here are the 8 steps you need to take before you build a home in the Australian Alps. Building in the Australian Alps has to be guided by the elements. Roof design, for example, is crucial to control snow dumps and you can’t rely on skylights for natural light because of the weight of snow. Rooms need to be sealed with no flues or vents, and you need mesh balconies to let snow through. You may also need to consider the delivery of materials to site and scheduling trades in extreme weather. At the other extreme, the hot, dry climate of the Australian Alps in summer make it a high-risk bushfire region. The Alps, particularly the Victorian Alps, are periodically subject to major bushfires and have been almost entirely burnt through by bushfires, notably; Black Thursday in 1851, Black Friday (1939) and during fires in 2003 and 2006-07. You can learn more about building for hot and cold climate here. It’s important your home meets current climate needs to ensure your comfort for years to come. Kitome uses passive design options so that you can take advantage of the climate and not only stay comfortable but reduce heating a cooling bills. Work with the Kitome team to survey your land and you can make use of prevalent breezes and the path of the sun. 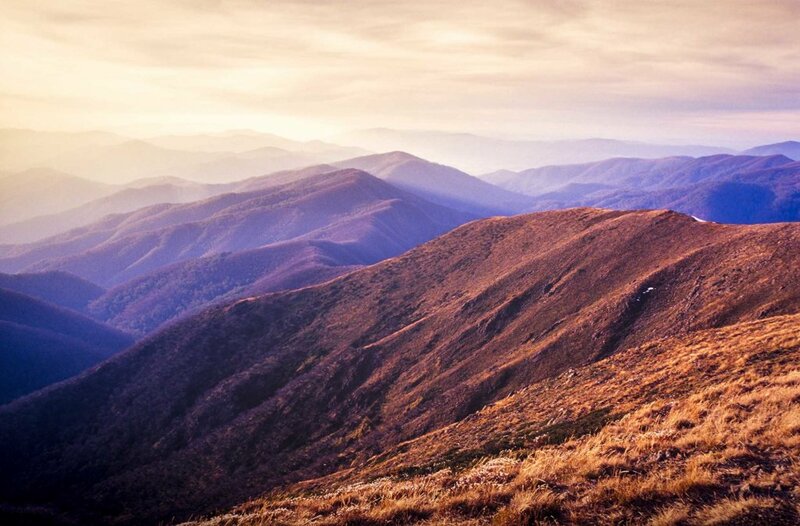 The Australian Alps Bioregion constitutes the highest section of the Great Dividing Range and includes Australia’s highest mountain, Mt Kosciuszko (2,228m). The landscape is characterised by peaked ranges, undulating plateaus and ridges, and broad, forested valleys. Much of the land is sloped and surrounded by escarpments and gorges. As mentioned above, the soil in the Australian Alps is some of the most fertile in the world but underneath this lies rock. At the higher elevations, ice crystals form inside rocks crack, speeding up the mechanical shattering of rocks. High rainfall also causes rock weathering and damage to alpine soil. For a detailed look at the different soil types in the Australian Alps click here. Soil information is important for a number of reasons, such as climate change, soil erosion, acidification and dryland salinity. Soil can make or break a construction project. Soil that changes shape or shifts may not bear the weight of some structures. They also have less impact on the soil and environment that a conventional build and blend in with the surroundings. The Great Dividing Range provides a natural separation of slower, wider rivers flowing west from faster, narrower coastal rivers flowing east. This can cause minor flooding in some areas of the Alps. In East Gippsland, weather systems commonly referred to as East Coast Lows can produce heavy rainfall. In June 2007, four major east coast lows occured in succession resulting in major riverine flooding. The threat of bushfires is the price to pay for a beautiful alpine location. Certain native flora relies on bushfire for reproduction and Aboriginal people believe it’s a deliberate gift from the fire spirit. It’s a natural part of the ecosystem and important in many ways but the impact it has on people, animals and industries can be catastrophic. When building in a fire prone area you should always avoid building with any flammable material. While there’s no guarantee a steel frame home will survive a big fire, a steel framed building is significantly more blaze resistant than wood framed construction. Travelling up the mountains you can observe four distinct zones of vegetation; lower slopes or tableland, montane, subalpine and alpine. The most obvious change is the transition at the tree line or upper altitude where trees grow. Above the tree line is the true alpine zone where there are no trees and vegetation is primarily dwarfed shrubs and ground-hugging herbs. Each zone is significant and important to the Australian Alps but importance aside, you need to consider the impacts of nearby trees and bushland on your home and the impact your home will have on vegetation. There are local tree protection laws in place so if you’re envisioning that trees will need to be removed, refer to your council’s standards before taking any action. A development assessment application is not required if you are planning a single residential dwelling on a serviced vacant lot, however assessment of your home plans is still required. When planning a subdivision, flats or units, or if planning a duplex, commercial or industrial building you will need a development assessment. Through Local Environmental Plans, Development Control Plans and other policies, councils regulate building and development within the Australian Alps community. Development Applications can be for land subdivision, commercial, industrial, residential and agricultural land uses. You will need to lodge a Notice of Commencement at least two days prior to commencing works and having appointed a Principal Certifying Authority, ensure mandatory inspections are undertaken and certified. With the steep terrain of the Australian Alps, as well as it’s freezing temperament, there are certain kit home designs that are best suited to the landscape. Think a Kitome could be perfect for the land? Download a brochure today or give us a call and discuss what you’ve learnt about the land. We’ll be able to help you find the right Kitome to suit both your land profile and needs.